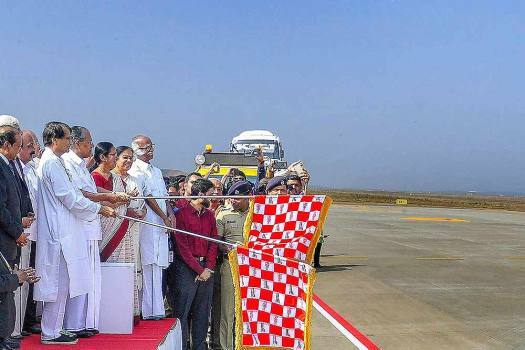 Union Minister of Defence Nirmala Sitharaman being garlanded along with Kannur BJP candidate CK Pathmanabhan during an election campaign rally for the Lok Sabha polls, in Kannur. 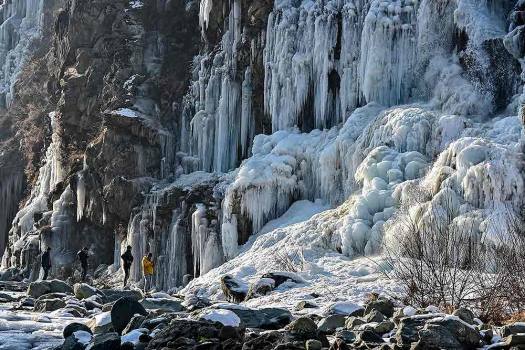 Tourists walk near the frozen water fall at Drung area of Tangmarg in Baramulla Distrct of North Kashmir. 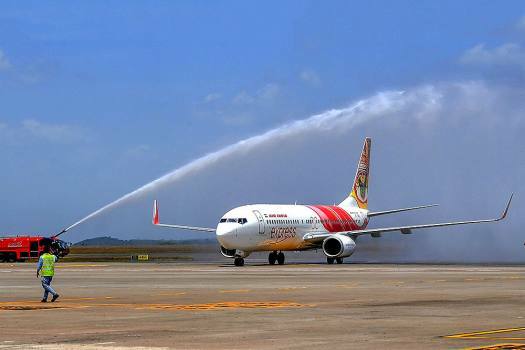 An Air India trial flight being accorded water salute after its successful landing at Kannur International Airport. 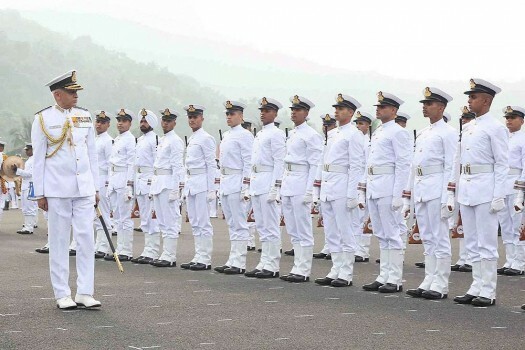 Chief of the Naval Staff Admiral Sunil Lanba reviews the passing out parade at Indian Naval Academy at Ezhimala in Kannur. 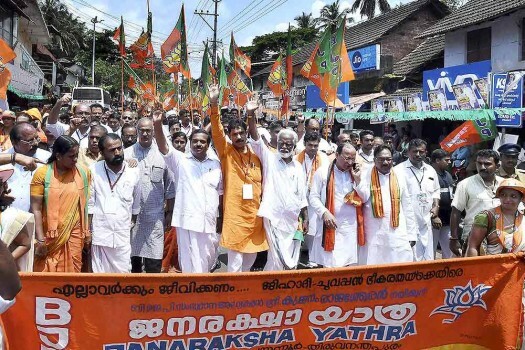 Kerala BJP President Kummanam Rajasekharan leading ‘Janaraksha Yathra’ at Pinarayi in Kannur. 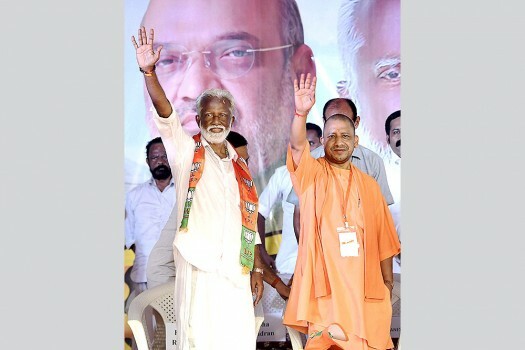 Uttar Pradesh CM Yogi Adityanath and BJP state president Kummanam Rajasekharan waves to the crowed at a public meeting as part of ‘Janaraksha Yathra’ in Kannur. 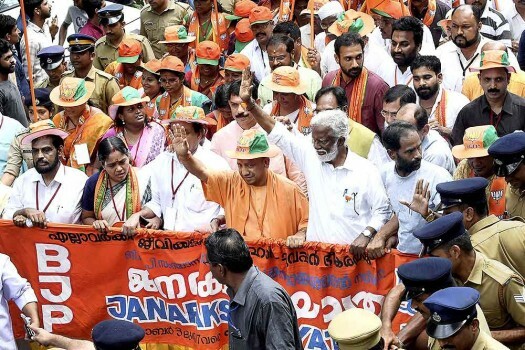 Uttar Pradesh CM Yogi Adityanath joins Kerala BJP President Kummanam Rajasekhara's ‘Janaraksha Yathra’ in Kannur. 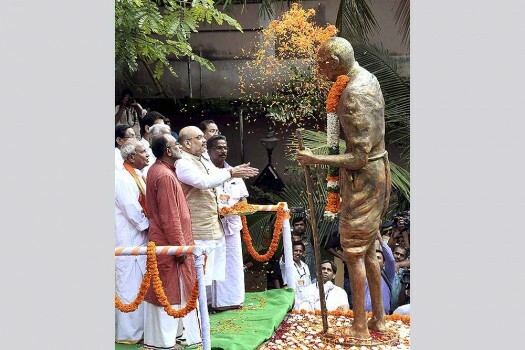 BJP National President Amit Shah paying floral tribute to Mahatma Gandhi at Payyannur in Kannur. 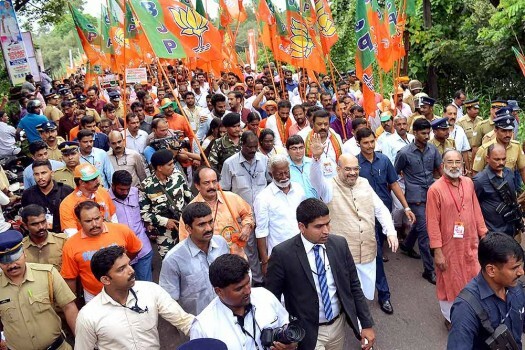 BJP National President Amit Shah waves to the crowd during the party's ‘Janaraksha Yathra' at Payyannur in Kannur. 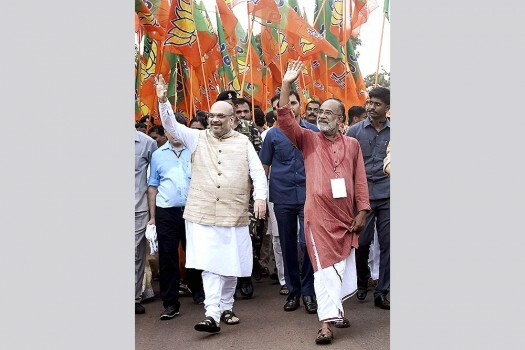 BJP National President Amit Shah and Tourism Minister Alphonse Kannanthanam waves to the crowed during the party's ‘Janaraksha Yathra' at Payyannur in Kannur. 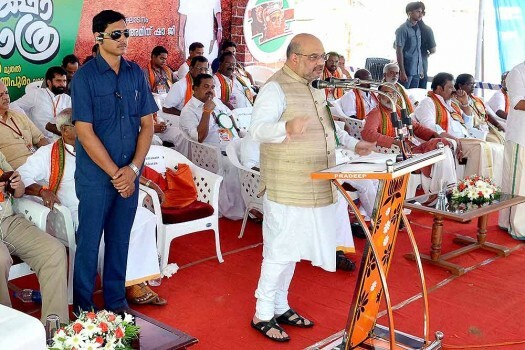 BJP National President Amit Shah speaks at the launch of the party's ‘Janaraksha Yathra' at Payyannur in Kannur. 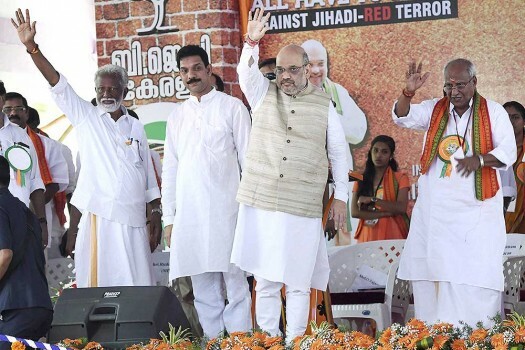 BJP National President Amit Shah at the launch of the party's ‘Janaraksha Yathra' at Payyannur in Kannur. 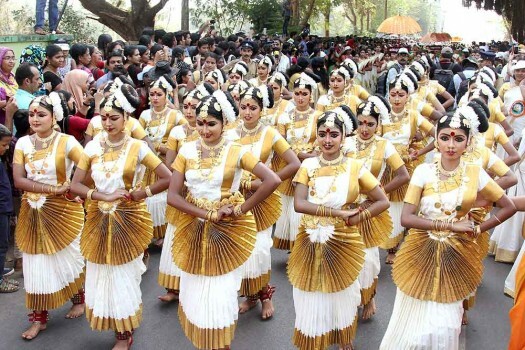 Students perform ‘Mohiniyattam’ to participate in a procession as part of Kerala State School Youth Festival, in Kannur. 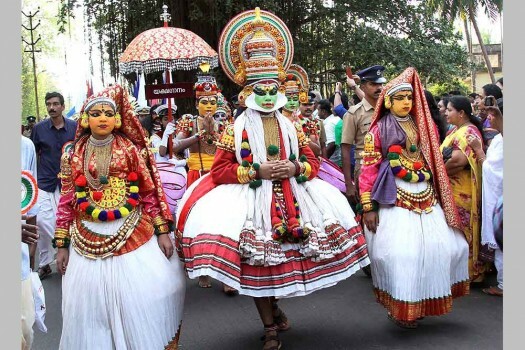 Students dressed as Kadakali to participate in a procession as part of Kerala State School Youth Festival, in Kannur. 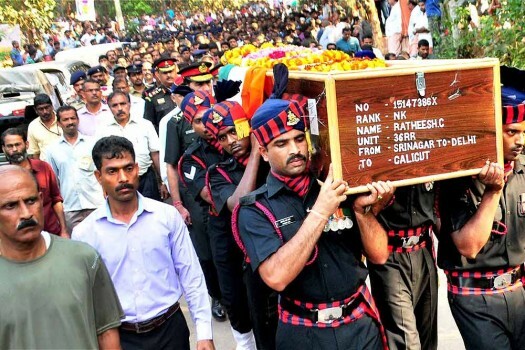 Army personnel carry the mortal remains of their colleague C Ratheesh, who died in the Pampore attack, at Mattannoor, in Kannur. 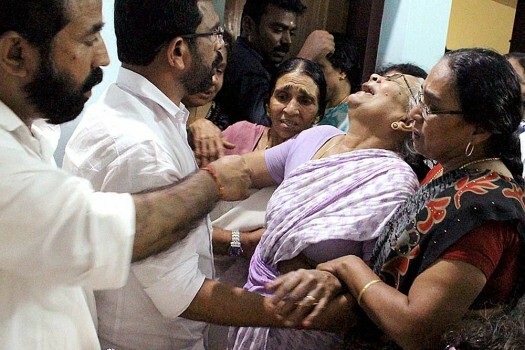 Slain BJP activist Ramith’s relatives crying at their residence at Pinarayi, in Kannur. 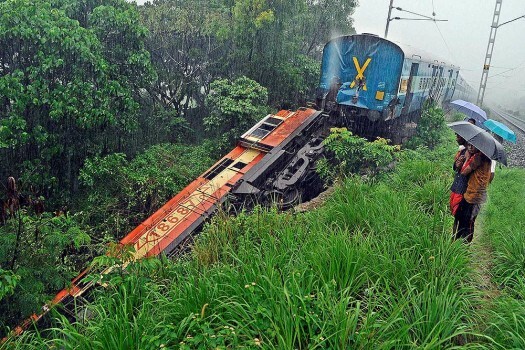 Engine of Alleppey Executive Express train derails due to heavy rain, in Kannur. A total of 35,874 people have been put up in 341 relief camps across Kerala, officials at the state Disaster Management control room said. 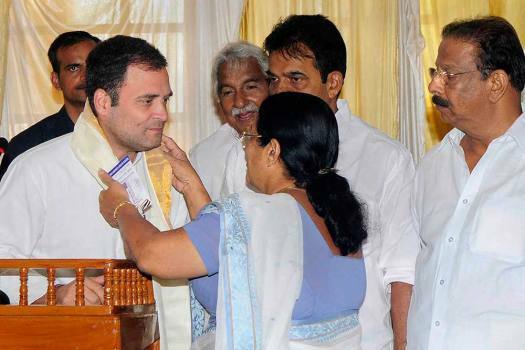 A new book on half-a-century-old volatile history of north Kerala explores the reasons, motivations and the local lore of 'India's bloodiest revenge politics'. The ABVP members had reached Kerala to participate in - 'Chalo Kerala' - scheduled to be held in the state capital Thiruvananthapuram on November 11. The activist KM Suresh, an auto driver by profession, was injured in the knee when some unidentified persons attacked him at Thalassery last evening. 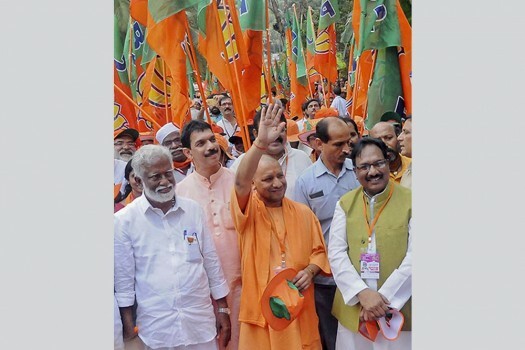 First Modi, Now Yogi -- Why Is It Tough For The BJP To Woo Keralites?